I guess Bintulu will need to plant more of these 'palms'. 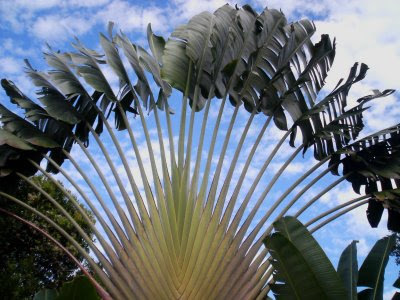 Called the Traveller's Palm ( Ravenala madagascariensis ) there are a delight to see as a distant. Looking like a huge fan, they look tempting to travellers as if waving them to come and stop by . Such icon would be good for Bintulu's tourism. Strictly speaking, these are not 'palms'. They belong to the banana family. However its palm-like in habit i.e. having a single trunk and a crown of leaves that is one-sided and making a symmetrical fan-shaped pattern. The above picture is taken at my eco-farm in Bintulu.